OSWEGO — From apps to interactive activities, SUNY Oswego students are finding a rising culture of entrepreneurship and are creating ideas aimed to solve a variety of problems. SUNY Oswego human-computer interaction master’s students (from left) Bharati Mahajan, Khushboo Panchal and Joseph Gray discuss their concept for Nero, a water tracking and conservation app, at the recent Grand Challenges Makeathon on campus, which challenged students for solutions related to the college-wide Fresh Water for All initiative. 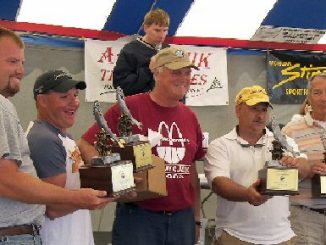 The competition and the student team are part of the rise in entrepreneurial activities and opportunities for SUNY Oswego students. This is the second year of Launch It, the student startup business competition, and the first year of the Grand Challenges Makeathon, which invites students to develop potential solutions and educational activities as part of the college’s Grand Challenges: Fresh Water for All initiative. Plus, for the first time, Oswego students participated in the recent Compete CNY competition in Syracuse, continuing a trend of college support for students with ideas, enthusiasm and business acumen, said Pamela Caraccioli, deputy to the president for external partnerships and economic development. Caraccioli said the culture at Oswego — from President Deborah F. Stanley through the faculty and staff — realizes the importance of supporting these student endeavors, and of finding resources to empower the entrepreneurial spirit and search for solutions. Human-computer interaction master’s students Bharati Mahajan, Khushboo Panchal and Joseph Gray made the biggest splash, as their water-monitoring app concept called Nero took third in the Energy and Environment category at Compete CNY, but Caraccioli noted all four teams of presenting students from Oswego were impressive. Another Oswego participant, strategic communication graduate student Fabio Machado’s Charta app, previously was a finalist in the Oswego County Next Great Idea competition for his concept that would help visitors explore communities. Cinema and screen studies major Victoria Jackson presented an inventive, inclusive and interactive concept, Make A Doll Workshop. Business administration major Aaron Shopland and marketing major Michael York presented Magnetic Waves, a scientific shark-repelling idea that won the college’s annual Launch It competition. “We hope this is the start of more students showcasing their brilliance and business savvy at SUNY Oswego, regional, state and national competitions,” Caraccioli said. The college’s brand new academic minor in entrepreneurship is expected to increase the activity and opportunities for students looking to turn their ideas into reality. 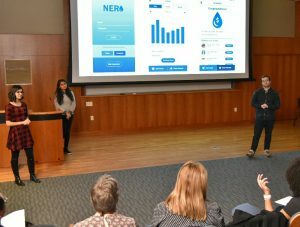 The Nero team came together during the college’s first-ever Grand Challenges Makeathon competition, which supports the campus-wide Fresh Water for All initiative. Participants in this campus event had a chance to hear from two Tech Garden representatives who helped with brainstorming techniques and how to pitch ideas. With a name inspired by the Greek and Sanskrit words for water, Nero would tap into digital assistants like Siri, Alexa and Google Home — with the user’s permission — to detect how much water a person uses per day and help users track and conserve water in their daily lives. The Grand Challenges Makeathon focused on pitching an idea in three minutes, but the five-minute presentation for Compete CNY also included a business plan. So Caraccioli connected students with John Halleron, the small business adviser in the college’s Office of Business and Community Relations. “He helped so much with understanding the financial aspect,” Panchal said. Gray was impressed with how much the campus supported their endeavors.